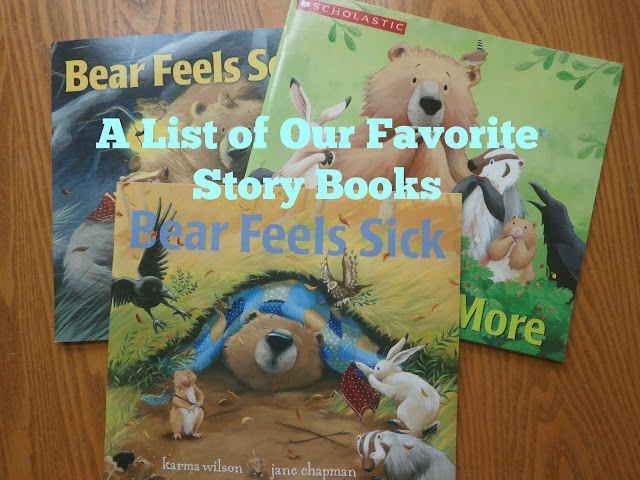 Yesterday I wrote a post about all of the chapter books we enjoy reading together or listening to in the car while we drive around and yet we have many simple picture books that we love as well. Today I thought I'd pull together a list of picture books that we have just fallen in love with. Honestly there are so many to choose from that it was not an easy list to make! Some books we fall in love with the characters, some books we just love the illustrations, some books are hilarious, some are touching; but we've discovered that most of them are just wonderful. 1. The Pigeon Series by Mo Willems-- We love these hilarious books. The boys love shouting "NO" to the pigeon when he asks to drive the bus or to stay up late past his bedtime. These books were great even for my "older" boys. By 8 years old or so they were still enjoying them and coming up with great story ideas to write/tell on their own about other misadventures the pigeon could get into. I love books that get them thinking about writing! 2. Bear & Friends Series by Karma Wilson-- touching stories about a bear and all his friends. The illustrations are pretty and the stories are simple. 3. Elephant and Piggie Series by Mo Willems-- We only discovered these books recently and they became a fast favorite. It helps that they were easy enough for my beginning reader to read on his own with just a bit of help. Elephant and Piggie are great friends and they show such expression with their faces and the sizes of their words. 4. Micawber by John Lithgow-- We love this cute story about a squirrel who decides to become a painter. There are references to real life works of art and the illustrations are wonderful. We actually had a book on CD copy where the author was reading it for us and it was phenomenal. 5. 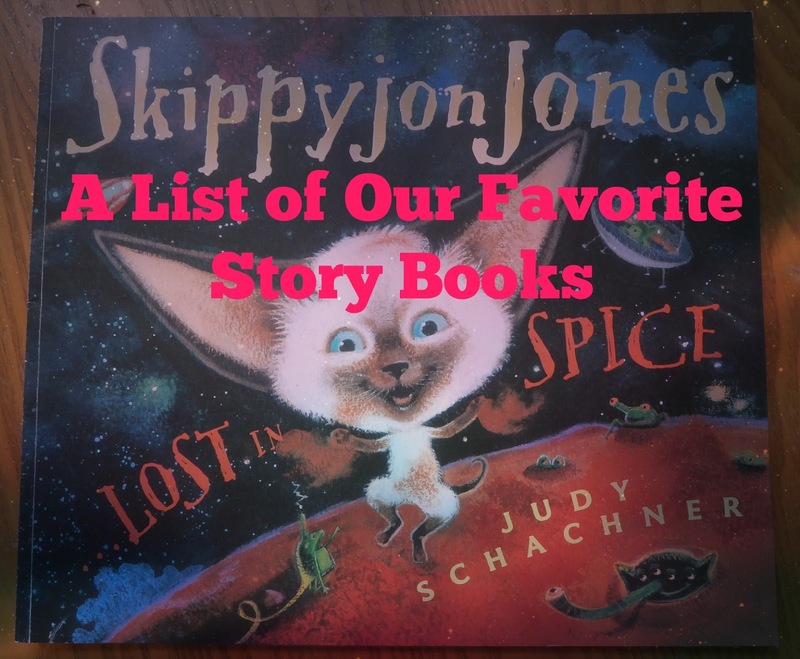 Skippyjon Jones by Judy Schachner-- My kids love Skippyjon Jones and we've read all of the books in the series. He's such a silly chihuahua! 6. I Stink!/ I'm Dirty (and all the other books in this series)-- by Kate McMullan. These books are great for any boy (or girl) interested in trucks! They have lots of descriptive words and are super cute stories. 7. Bark, George! by Jules Feiffer-- We loved Bark, George! and borrowed the book on CD from our library so many times. It's a cute story about a dog who ends up meowing or quacking when his mother tells him to bark so she takes him to the doctor to find out what is wrong with him. It's quite funny but I won't spoil the ending for you. 8. Blue Goose by Nancy Tafuri-- Another adorable story where the animals all get together to paint the farm while Farmer Gray is away. The book starts out in shades of black, white and gray and the animals mix red, yellow and blue to make all the colors on the farm so they can surprise Farmer Gray when he comes back home. 9. I'm the Biggest Thing in the Ocean by Kevin Sherry-- We read this book together so many times my middle son had it memorized by the time he was 4; I swear it's the book he used to teach himself to read. It's a story about a giant squid who goes around comparing himself to everything in the ocean convinced he's the biggest thing in there... or is he? 10. Rikki Tikki Tavi & The Jungle Book stories by Rudyard Kipling and retold many times; They are both great adventure stories filled with interesting animals and characters. My boys just loved them. 11. Dino- Baseball (and all the other sports that are part of this series) by Lisa Wheeler-- A fun series in which my boys learned a lot about all sorts of sports. In each book the plant eaters face off against the meat eaters for a fierce battle. Filled with lots of vocabulary words and packed with action they're great for any kid that loves dinosaurs or sports. 12. Six By Seuss--Anything by Dr. Seuss really! Who doesn't love rhyming, silly stories? My kids love all the stories by Dr. Seuss! They especially love The Lorax and The Cat in The Hat. 13. Trucktown books by Jon Scieszka-- This is a whole series of books written around trucks of all kinds. The particular favorites around here are Melvin Might? and Smash! Crash! 14. Curious George by H. A. Rey-- Who doesn't love this adorable little monkey? He's always got the best of intentions and somehow manages to get into trouble. I think many kids can relate to that and all of the stories have always been a huge hit with my boys. 15. Little Critter series by Mercer Mayer-- Another book series with what I consider classic characters. My kids love reading all about little critter's troubles and trials as he often messes up his plans to help. 16. Strega Nona by Tomie dePaola-- My kids actually enjoy all of dePaola's books but Strega Nona was a particular favorite. Most of his stories are set in old Italian villages and have a bit of mischief and magic thrown in. 17. Goodnight, My Duckling by Tafuri Nancy-- A cute little story with wonderful illustrations where a mother duck is leading her kids home for the night to put them to bed. Along the way one little duckling trails behind all the others and the animals that it passes all wish him "good night." 18. Chicken Cheeks by Michael Ian Black-- it's one of those books that's just so silly it's bound to be a family favorite. There are only two words or so on each; chicken chicks, deer rear, moose caboose, you get the idea. It's all about silly rhyming names for animal bums and my kids all think it's a riot! 19. Click, Clack, Moo Cows That Type by Doreen Cronin is part of a series of books written about a barnyard where the animals do all sorts of unusual things and it annoys Farmer Brown to no end. The cows leave him messages and go on strike. In one book Duck runs for president. They are so funny and easy to love. 20. Doggone Dogs! by Karen Beaumont-- Talk about mischief makers! These 10 dogs are no sooner out of the house than they're wreaking havoc everywhere. They're captured by the dog catcher, escape and find their way back home only to start all over again another day. 21. If You Give a Pig a Pancake by Laura Numeroff is another book that's part of a series and we've read them all. One thing I particularly loved about this series is that it got my boys thinking about stories they could write/ tell that would be just like hers. If you've never read them they go on and on... if you give a pig a pancake chances are he's going to want some syrup to go with them. If you give him some syrup he's going to need a bath, then he's going to ask for some bubbles and each page leads to something else the pig needs until you get right back around to giving him another pancake. 22. Bats at the Beach by Brian Lies-- is another book that's part of a series. My boys love reading about the bats and their antics. The books all take place at night while the whole world is sleeping. With great illustrations and cute rhythmic text they're a hit in this house. 23. The Napping House by Audrey Wood-- We love most books by Audrey Wood they combine compelling stories and wonderful illustrations. The napping house is written much like a "house that Jack built" kind of story where every page adds onto where the last page left off so it's also a great predictable text that kids can following along with. 24. If I Built a House/ If I Built a Car by Chris Van Dusen-- these two books are great! The illustrations are bright and colorful and they really got my kids thinking about all the things they'd like to include in their houses or cars if they were in charge. Think kitchen that cook and clean up themselves, trampolines in the living room, etc. It really gets kids thinking outside the box and making up new inventions. 25. No Jumping On the Bed/ No More Water in the Tub! by Tedd Arnold-- These two stories are hilarious. In No Jumping On the Bed Walter jumps so hard his bed crashes right through his floor and from there keeps crashing through floor after floor in his apartment building including lots of rhyme and meeting lots of his neighbors. It's funny and cute with bright illustrations. No More Water in the Tub William's getting ready for bed when the faucet breaks and he goes surfing through his building also meeting lots of rhyming neighbors. We love most books by Tedd Arnold anyway since he's one of those children's authors who just "get" the way that kids think and look at the world. Oh, I didn't know there was another one of those squid books. My son LOVED "The Best ARtist in the Ocean." Yes, we've read that one too; they are so cute aren't they? Oh I am so glad I could help. I hope she enjoys it as much as we do! Looks like a delightful collection of storybooks! Love! These are such lovely books. I must say I have not heard some of them before - so I will need to check it out. I think Evelyn would love to read some of these too. This look like some great gift ideas for my four great-children who are all getting to the perfect age for them. Nice selection...thanks for sharing them.